The crash happened earlier in June, when Hammond and co-host James May were out filming runs on the Hemberg Hill Climb in Switzerland. Hammond was in the Rimac Concept One electric supercar, and crashed off the top of the hill after his last run of the day. After flying through the air and rolling, crews got Hammond out of the car just before it burst into flames. Host Jeremy Clarkson later said he “genuinely thought” Hammond was dead when he saw the wreckage. Hammond got an airlift to the hospital, where he let everyone know he wasn’t dead and got major work done to his busted knee. Meanwhile, the FIA was worried about its reputation. In the weeks since the crash, we really haven’t gotten many details on what happened. 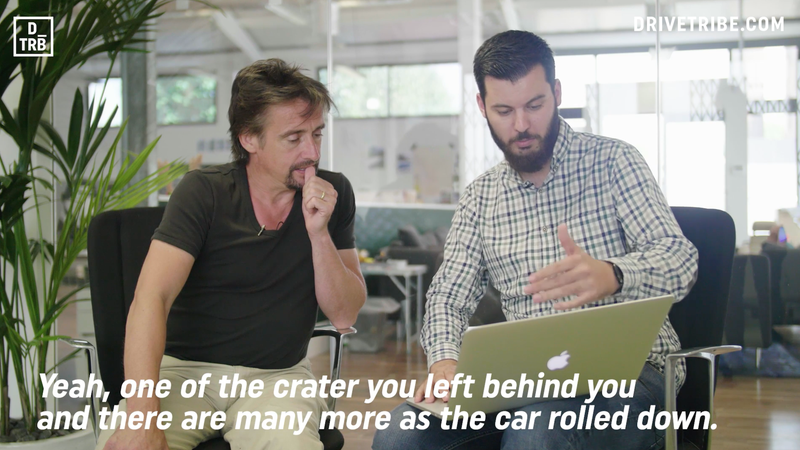 But in a video posted to DriveTribe on Tuesday, Hammond and Rimac CEO Mate Rimac gave a full 26-minute breakdown of the events leading up to the crash and the terrifying wreck itself. The video can’t be embedded, but can be seen here. If you’re trying to sneakily keep up with the car news at work or just can’t make the time for a 26-minute video, we’ll give you a quick summary. Hammond and Rimac sat down with diagrams of the course and the wreckage, saying that the Hemberg Hill Climb has an altitude increase of 157 meters from start to finish. The filming included three supercars: an old-school gas-powered Lamborghini, the hybrid Acura NSX and the electric Rimac. A director asked Hammond and May to make another run on the hill climb at the end of the day, and Hammond joked back more than once that he knew this would be the one they wrecked on. Hammond went off of the course past the finish line, meaning he had a long tumble down the hill afterward. Crash data showed Hammond flew around 30 meters, hit another road and kept rolling for about another 100 meters. There were three houses along the way, but the car’s path curved and missed them. But other than his knee, Hammond didn’t get too much of a beating. He said despite a lot of rolling and the car having a small clearance above his head, the noggin stayed pretty intact throughout the wreck. Hammond asked the crews at the scene to drag him out of the car by his arms because he thought he broke his leg, and then he wound up at the hospital. Ouch, in more ways than one.